One of the best ways to save energy is often overlooked, perhaps because it's so simple. While I'm using a single-family home for illustration, the same techniques are just as effective for apartment houses and commercial buildings. 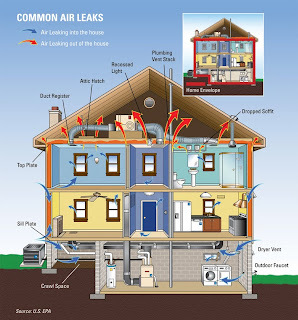 If you find air leaks and seal them you can often save about 15% on your energy bills. Air leaks occur not only in ductwork, windows and around doors, but in any place in which a wall, ceiling or floor has a hole. It's easier to install things like plumbing and appliances with nice, big holes, but contractors often fail to close up the holes when their work is done. Often people fail to insulate all of the areas they should, like underneath the floorboards on the first floor.